Welcome to our $30 Olive Garden GC Giveaway. This Giveaway is being hosted by Tammie's Reviews, Giveaways and More, Couponing Momma Giveaways and Reviews and Just Sissy and promoted by some awesome Bloggers. The Gift Card is being sponsored by Olive Garden. Did you know it's back? By 'it', I mean the 2 for $25 Italian Dinner at Olive Garden. My family loves their food. It is Andrew's favorite pick and we have been eating a lot of birthday meals there. With the 2 for $25 and the other specials Olive Garden currently has, it makes dining out much more affordable. Please keep reading and enter to win an Olive Garden Gift Card below. Celebrate the season of love by spending time together over Olive Garden’s 2 for $25 Italian Dinner, an abundant three-course meal for two – all for $25. Olive Garden’s 2 for $25 Italian Dinner (also available on Valentine’s Day and for a limited time after) includes unlimited breadsticks and choice of homemade soup or garden-fresh salad; choice of two entrées from a variety of delicious options; and choice of two Tastes of Italy Small Plates or a dessert to share. 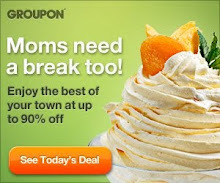 For more details, visit OliveGarden.com/Menu/Specials. And starting Monday, Feb. 10, Olive Garden’s $10 Signature Classics is back. All day Monday through Thursday, bring the whole family to enjoy another affordable meal together. Olive Garden is the one place that you can take the whole Family out to dinner and not wreck your budget. Everyone can pick what they want to eat for a very affordable price. 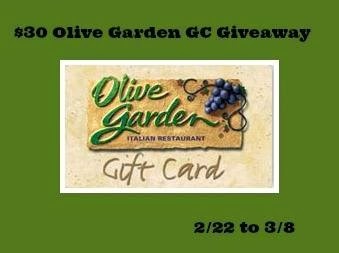 This giveaway will be live from 2/22 and will end on 3/8, starting and ending at 7 p.m.
1 winner will win a $30 Olive Garden Gift Card. Disclosure: We are not associated with any of the companies named above. No purchase is necessary to enter. Void where prohibited by law. The odds of winning are based on the number of entries received Open to the US 18+ only. Confirmed Winner(s) (by Random.org) will be contacted by email. Winner(s) have 24 hours to respond before a new winner is chosen. No purchase necessary. Void where prohibited by law. The sponsor(s) will be responsible for product shipment to winner(s) of this giveaway. My blog is not responsible for product shipment/delivery. This event is in no way administered, sponsored, or endorsed by, or associated with, Facebook and/or Twitter, Google, Pinterest. This disclosure is done in accordance with the Federal Trade Commission 10 CFR, Part 255 Guides Concerning the Use of Endorsements. Entrants must only enter with either one email address, IP address and/or Facebook account, anyone found violating these rules will be disqualified. It is at the sole discretion of the admin of the giveaway if the winner has met the rules or not. Our favorite place to go out to eat is Chillies! I could eat there everyday, I love it! Funny you should ask where my favorite place to eat it....because it is truly Olive Garden!!! I love Olive Garden, I really love the salad. I am obsessed with Thai food, but don't have a favorite meal in particular. My favorite place to eat right now is…gosh I am really dragging my brain and I have to say its the eat-in movie theatre. I have so much fun there with my kids that the food just tastes better. Other than that, I love this little place near my home thats local. My favorite place to eat is Olive Garden, I like their Lasagna! Olive Garden is my favorite place to eat, I love getting the Steak Gorgonzola Alfredo! It is so good! Olive Garden is my favorite place to eat. I love their five cheese ziti. So good!! I love eating at Olive Garden! My favorite meal is the lasagna! Yum yum! I like to eat at Olive Garden or Red Lobster. My favorite place to eat is the Olive Garden. I love their breadsticks and salad and the chicken alfredo. Yum! I do like Olive Garden bread sticks! But my favorite is lasagna ! !